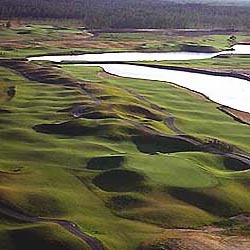 Moorland at the Legends earned it's designation as one of the "Top 10 New Courses of 1990" by Golf Digest and in 1991, Golf Digest crowned Moorland one of the "Top 5 New Public Courses in America." P.B. Dye's flair for deep bunkers, multi-level fairways and greens, and signature bulkheads have transformed this course into one of the most sensational challenges on the East Coast. Play many of the most feared holes in Myrtle Beach as well as the shortest par four guarded by "Hell's Half-Acre". This is definitely a "target" golf course. It is also a controversial golf course. Moorland will cause the golfer to rise to incredible heights and constantly use every bit of skill and luck in their possession. Whenever and wherever golfers gather and the discussion turns to "most memorable golf holes," "most surprising golf holes," or even "most feared golf holes," you can be sure that Moorland will be mentioned.